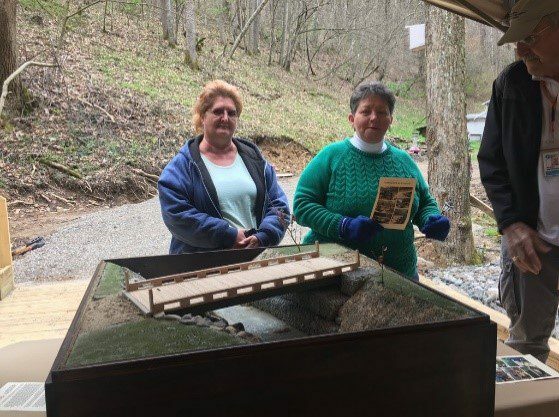 The Atkins Bridge home owner, left, and WV VOAD Director Jenny Gannaway with a model of the bridge on the bridge. In September 2017, PDA graciously granted the WV VOAD Bridge project $90,000 to fund the building of bridges in WV. Immediately, $45,000 was released; the second $45,000 is soon to be released, after the spending of the first half of the funds. Since then, the PDA funds have made an astounding difference in the bridge project’s ability to move forward more quickly and efficiently. What a gift to be able to pay for administrative costs, fill in gaps in funding bridges, pay for simple things like mileage for the engineer and building coordinator to visit sights, prepare for and get signatures on legal paperwork and do the work of preparation for the builds. The WV VOAD Bridge Project has been very careful to only use PDA funds when other sources could not help. Often, when a bridge is presented at the unmet needs table, other organizations are eager to pay for building supplies but not for administrative costs or engineering. But without both, the building supplies could not be used. Presbyterian Disaster Assistance’s willingness to pay for those important planning and legal paperwork costs is invaluable. Some of the funding from PDA is being used to create a book of engineering project guidelines that may be shared with other organizations around the country and world who may find themselves needing to build bridges. This will give other organizations a head start. WV VOAD is poised to spend $16,346.93 for a bridge that PDA will completely fund. This will complete the spending of the first half of the grant funds and would begin spending of the second half of the grant funds. Crews are in place to start the build in the next month and a half. The address of the new bridge is 153 Broad Tree Run, Charleston, WV 25320. We are so grateful for the support and encouragement of Presbyterian Disaster Assistance.